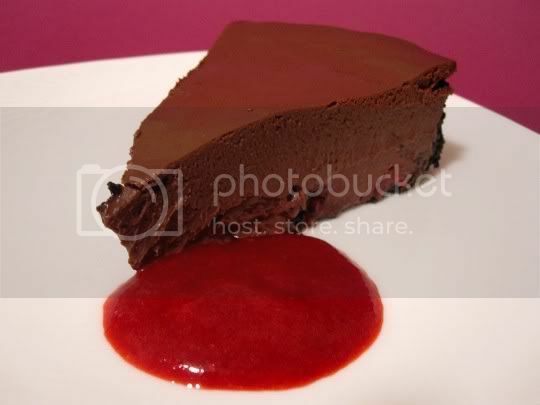 Chocolate and raspberries: the perfect combination, and this cheesecake is the epitome of it! It's so rich, so chocolatey, so fudgy...and the bursts of juicy, sweet, tart raspberries are the most amazing complement. But get ready: for such an extraordinary dessert, there's a lot of work involved! This was my first attempt at a "real" cheesecake (the springform pan, the water bath, the overnight fridge sitting)...and it actually turned out pretty well. I also got to use my brand new food processor, and OMG I LOVE this thing...a GREAT investment for so many reasons (blenders can only do so much as a stand-in)! Start by making a homemade crust: crushed chocolate wafer cookies (use Nabisco Famous Chocolate Wafers), walnuts, brown sugar, a little oil to hold it all together, and a hint of cinnamon. Whirl it all together (here comes the first food processor miracle), dump it in a greased 9-inch springform pan, and press evenly onto the bottom and halfway up the sides of the pan. Bake and cool. Now for the fun part (witness the second food processor miracle): whirl together cream cheese, eggs, cocoa powder, white and brown sugars, melted chocolate, vanilla, and the secret ingredient...tofu! Trust me, you will barely taste it in the finished product; I think it's mainly there for texture. Spread raspberries (try using fresh vs. frozen, more on this later) on the bottom of the crust, then spread with the cheesecake mixture. The baking process requires about an hour in a water bath (set the foil-covered pan in a roasting pan halfway filled with hot water...this creates steam during baking and will prevent your cheesecake top from cracking! ), then an hour cooling in the oven with the door cracked (see what I mean about time-consuming? )...THEN cool completely and THEN refrigerate overnight. Sheesh! At some point, you'll need to make the raspberry coulis: a sauce consisting of pureed raspberries (food processor miracle #3), a little orange juice, and a little powdered sugar for added sweetness. The recipe says to strain the puree over a bowl using a fine sieve, but I found I actually had to "push" the juice through with a spoon to speed up the process. This was a bit laborious, as there was a lot of puree and the goal is to get rid of all the seeds, but it was worth it in the end. The coulis was juicy, creamy, and oh-so-fresh tasting, with just a hint of citrus flavor. So when it's FINALLY ready that next day, here's what you'll get: the most velvety, smooth, thick, rich chocolate dessert you've ever eaten. Interestingly enough, the texture and taste of this are more fudge-like than cheesecake-like; in fact, I could barely even taste any "cheese" because I was so overwhelmed (in a good way) by the chocolate. I also think maybe it could have baked a little longer, as it was a bit too creamy for what I'd expect a cheesecake texture to be. Then again, the tofu probably had something to do with that. The tofu also probably made the overall cake a little too "wet": the crust got a little soggy (and gritty), especially the bottom...then again, that could have been because I used frozen instead of fresh raspberries. That being said, the leftovers are okay for a few days, but just know that your crust texture will change. Trust me though, this does NOT negatively affect the taste! Make again? Yes, chocolate lovers unite (after a day of waiting LOL)!